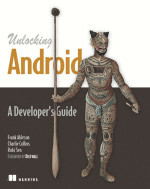 Thanks to Szczecin JUG I had opportunity to read Unlocking Android - A Developer's Guide. The title very accurately describes contents of this book. It is truly a developers guide, but also something more. If you are reading this review, you probably already heard about Android? For sure this name does not only denote a bunch of mobile devices, nor it only refers to specific operating system. Android is one of the platforms provided by Google. I found very interesting opinion somewhere on the web. The author concludes that Sun and Google both have three different Java editions. As Sun provides Enterprise Edition, Standard Edition and Micro Edition, Google offers Cloud Edition (Google App Engine for Java), Web Edition (Google Web Toolkit) and Mobile Edition (Android). Comparing Android to JavaMe is not completely fair. However such comparison shows how many possibilities Android platform provides in the field of development for mobile devices. From this perspective 'Unlocking Android' is not only a developers guide - it is a book about one of important Java editions. Software developed for mobile devices has it's very own specifics and Android platform offers special approach for addressing them. The book describes these topics to great extent also showing interesting comparison with other major mobile platforms. Structure of the book is very convenient for the reader. However be prepared that it is more step-by-step guide then detailed reference of Android APIs. It starts with general concepts, and goes through detailed description of Eclipse based development environment, specifics of UI design, code examples of available APIs, and ends with core topics from the Hacking Android chapter. Each chapter contains a lot of diagrams and screenshots in addition to text and code fragments. The code examples are usually short, and possibly refer only to concept they are supposed to explain. However the sequence of involved machinery is described as deep as it matters - sometimes as deep as the level of Linux operating system internals below Dalvik virtual machine. The whole Unlocking Android, it's structure and contents, is influenced by psychology of the end user of mobile device - the role of user's Intent as declaration of need. APIs which reference the real world have a real world illustrations - e.g. location API has picture of little globe describing latitude and longitude concepts. However I remember such picture from primary school, it seems very useful in this place. The consequence of such amount of information enclosed in one source (almost 400 pages) is that it could be hard to use it as a quick reference. Unfortunately the Android Market and procedures of publishing the application are described very briefly. Android platform is evolving very quickly and I hope that book will be updated to include new features. Who will benefit from reading Unlocking Android? I find it convenient and clear, but novice to software development could be confused. Authors assume that reader has experience in programming techniques, XML related topics, and Java in particular. Regardless of good IDE support the topic of development for mobile devices is quite complex. The requirements of good software design can interfere with the requirements of high performance and low memory footprint. It reminds me the time when I was coding in assembler :) . If you want to develop application on Android platform and have strong background in Java then the Unlocking Android will help you for sure.